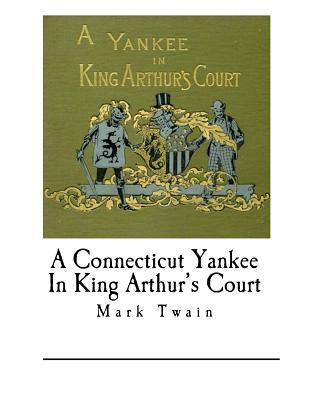 A Connecticut Yankee In King Arthur's Court by Mark Twain A Connecticut Yankee in King Arthur's Court is an 1889 novel by American humorist and writer Mark Twain. The book was originally titled A Yankee in King Arthur's Court. Some early editions are titled A Yankee at the Court of King Arthur. The novel is a comedy that sees 6th-Century England and its medieval culture through Hank Morgan's view; he is a 19th-century resident of Hartford, Connecticut, who, after a blow to the head, awakens to find himself inexplicably transported back in time to early medieval England where he meets King Arthur himself. The fictional Mr. Morgan, who had an image of that time that had been colored over the years by romantic myths, takes on the task of analyzing the problems and sharing his knowledge from 1300 years in the future to modernize, Americanize, and improve the lives of the people. In addition, many passages are quoted directly from Sir Thomas Malory's Le Morte d'Arthur, a medieval Arthurian collection of legends and one of the earlier sources. The narrator who finds the Yankee in the "modern times" of Twain's nineteenth century is reading the book in the museum in which they both meet; later, characters in the story retell parts of it in Malory's original language. A chapter on medieval hermits also draws from the work of William Edward Hartpole Lecky.